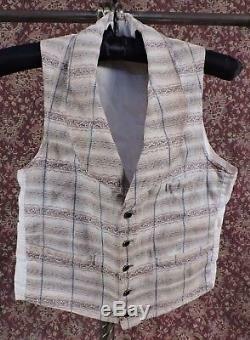 PRE CIVIL WAR 1840S STRIPED COTTON MENS WAIST COAT. 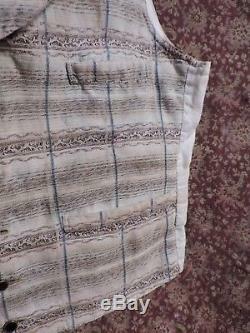 FASHIONED OF BROWN STRIPED COTTON. 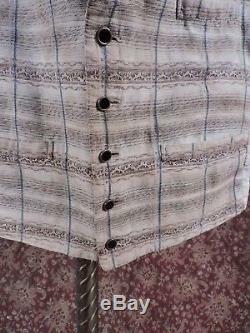 POCKETS ON EACH SIDE WITH HIGH CHEST POCKET. 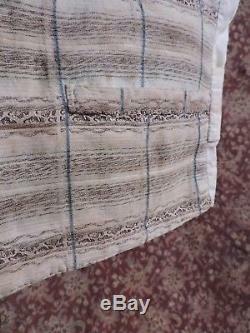 COTTON BACKING WITH BELTING, THE BELT WAS STITCHED CLOSED AND NO BUCKLE FOUND, AT THE BOTTOM TO ADJUST THE SIZING. GOLD METAL EDGED BUTTON LINKS CLOSE. THERE ARE SOME SMALL SPATTERED AGE COLOR STAINS SEEN ON THE INNER LINING AND BACKING. All flaws if any are painstakingly outlined. _gsrx_vers_827 GS 7.0.13 (827). The item "PRE CIVIL WAR 1840S STRIPED COTTON MENS WAIST COAT" is in sale since Sunday, March 11, 2018. 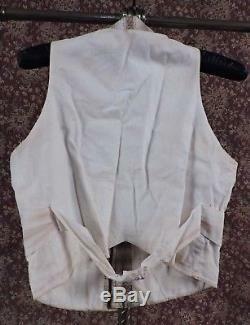 This item is in the category "Clothing, Shoes & Accessories\Vintage\Men's Vintage Clothing\Vests". The seller is "jamiexmas*" and is located in Southbridge, Massachusetts.